last Friday we (Rowing Man and I) attended a true celebration of life. One of Rowing Man's young patient's died at home, in the night, with her family. She had a lymphoma and she and her family had lived very bravely with this for 9 years. She planned her celebration of life service, with her family and friends in the months and weeks before her death, 'cos it simply cannot be called a funeral. I have heard many funerals described as celebrations of life, but this would have to be the first one that truly was a celebration. I did not know this woman, or her family, and if they ever read this, I do hope that they are not offended at all, but I am truly touched by how this remarkable woman, with her family and close friends, chose to live though her illness, and death with such incredible dignity and love. I think that is a wonderful way to say goodbye. She had a beautiful outlook on life and also when the end of life came. It's a very touching post! 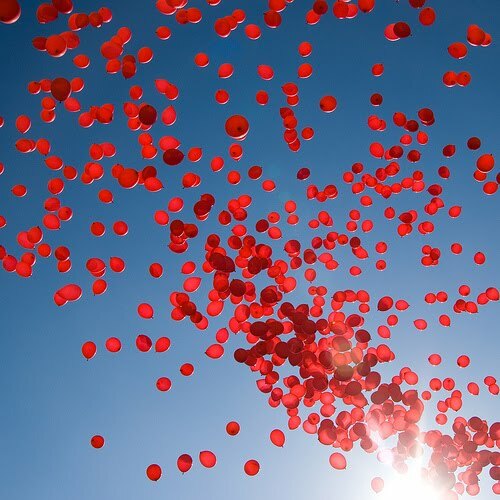 What a magnificent blue sky against those red balloons! It could only ever bring a smile to your face even at such a hard time. Just beautiful! What an amazing way to celebrate life....I think quite often when someone knows their end is neigh they reflect back on life and wish for everyone to celebrate the joys that they had.... I would love for my family and friends to do the same for me... I have been to 2 celebrations of life and they are a moving experience to be sure. Hi Shiree, life sometimes throws us some challenges, and the difference in the results are how we choose to deal with things. Thanks for sharing. Kind regards, Anita. Nothing springs to mind more than freedom, joy and happiness when I looked at this beautiful photo. All the things we want for a special person when we are celebrating the life they lived. This brave lady will have those things with her now.Moving post Shiree. Thanks for sharing.